The 18th Amendment to the United States Constitution made it illegal to sell, manufacture, and transport alcohol. Proposed to Senate on Dec. 18, 1917, it was approved by 36 states, ratified on Jan. 16, 1919, and went into effect on Jan. 17, 1920. The Volstead Act set out rules for enforcing the ban as well as defined the types of alcohol included under the ban. Prohibition led to widespread flouting of the law by otherwise law-abiding citizens and paved the way for a powerful, lucrative, and violent black market dominated by organized crime and corruption. Chicago’s most notorious gangsters made their fortunes during this chaotic time, criminals like Al Capone and Bugs Moran made millions running speakeasies throughout the Chicago area. Prohibition lasted until Dec. 5 1933 when the 21st Amendment repealed the alcohol ban set out in the 18th. The only way it was legal to drink during prohibition was to be granted a prescription from a doctor. 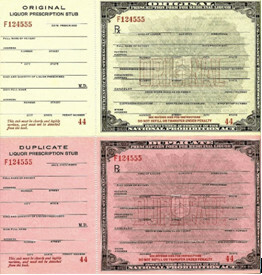 These mint condition prescription slips were issued by the Treasure Department and were usually used for Whiskey or Spirits Frumenti although they were occasionally awarded for wine or brandy as well. Printed on beautiful paper, these forms measure 8.5” x 4.5” and feature the original watermarks. Asking price: $19.99 + shipping. 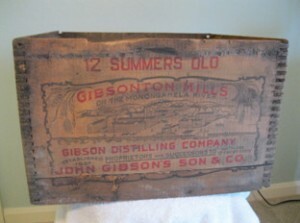 This beautiful old crate features the Gibson Distillery lettering and design and held 24 pints of “Non-Beverage Pure Rye Whiskey” manufactured prior to Prohibition coming into effect. Labeled “For Medicinal Purposes Only” this liquor would have been distilled beginning in 1913 and bottled in autumn of 1924 and was 100 proof. A great place to store your secrets or just an interesting display piece, the charming wood burned design is a great addition to any Prohibition collection. Asking price: $299 + shipping. 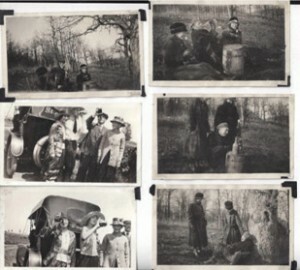 This great collection of six photographs taken during Prohibition demonstrates quite clearly the effectiveness of the ban against alcohol. Featuring a Model A Roadster or Touring in the background, this collection shows how the average person was still able to enjoy their drink of choice despite the illegality of purchasing, consuming, and transporting alcohol. Measuring 4.5” x 2.75”, these photos show small signs of being in an album but are in excellent condition and would make a great addition to your collection. Asking price: $14.50 + shipping.